Our take on eggnog. 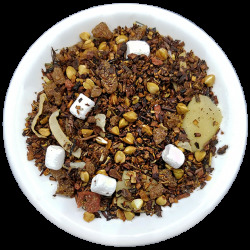 Indulge yourself with this rich blend combining organic rooibos with freshly-grated nutmeg, vanilla bean, almonds and bourbon flavor to create a wonderful creamy, rich tea sweetened with maple and marshmallow for added creaminess. Naturally caffeine free.